Kay Nolan was born in Hamilton in 1915 to Mary Ann (O’Brien) and John J. Hunt, K.C. She was the cherished wife of Edward (Paddy) Nolan, D.F.M., C.A., dear mother of John, Dermot and Mary and fond grandmother of eight grandchildren. She was a graduate of Loretto Academy, McMaster University and the Ontario College of Education who became a dedicated high school teacher and the first woman ever elected to Hamilton’s Catholic School Board to which she dedicated herself as a Trustee for almost 20 years. In 1988, she received the Award of Merit from the Ontario Separate School Trustees’ Association for outstanding service to Catholic Education. Kay was a proud Hamiltonian whose life reflected her commitments to her family, faith and community and her abiding belief that “of those to whom much is given, much is expected”. 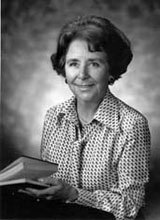 Upon her death in January 2007, her family chose to establish the Kathleen C. Nolan Education Fund in memory of her lifelong dedication to education as a teacher, school trustee, mother and grandmother. In particular, her appreciation of faith, language, music and art will be remembered in considering appropriate applications for the proceeds of the fund on an annual basis. An online donation is one way to make a gift to the Kathleen C. Nolan Education Fund and is tax deductible. Or you may contact the Hamilton Community Foundation directly to make a gift.